Some people find it difficult to get to sleep at night, particularly when they’ve had a hectic day and have a million things running through their mind. Unfortunately, it can sometimes be just as hard to get the kids to sleep, especially if they still have pent up energy. While a relaxing bath sometimes does the trick before bedtime, story-time can work just as well. But it all depends on the story- you don’t want the kids getting too excited or restless before they have to fall asleep. 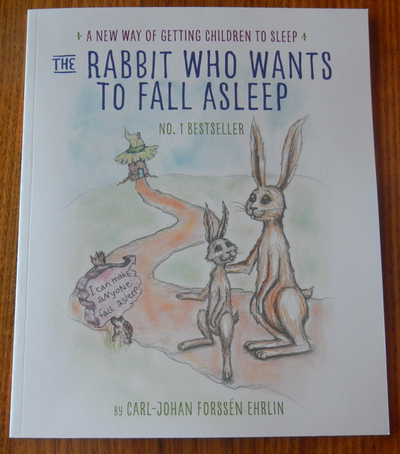 The key is to find a book that will make them gradually dose off as you read to them, which is where this picture story book by Swedish behavioural scientist Carl-Johan Forssén Ehrlin comes in. Topping the Amazon bestseller list, and later picked up by large publishing house Penguin, this story about a rabbit named Roger embraces the author’s psychological background and encourages a new nightly ritual to help children to sleep. Roger really wants to fall asleep but is having trouble, so he and Mummy Rabbit set off on a journey to visit Uncle Yawn, who knows just what to do to get Roger to fall asleep. Along the way they meet up with Sleepy Snail and Heavy-Eyed Owl, who also impart their own words of wisdom. The Rabbit Who Wants To Fall Asleep features a lot of text, despite being a picture story book, and the pencil-drawn illustrations only highlight the fact that this book started out as a self-published project. This book is essentially a form of meditation/ hypnotism for children, using repetitive words and actions (yawns), especially ones that have associations with sleep. There are also instructions at the beginning of the book explaining to the reader that bolded words in the story need emphasis and words written in italics need to be said slowly (which only draws out the book longer in my opinion). The word ‘now’ is used often, which further reiterates my belief that the book is intended to lull the child to sleep using sneaky hypnotist ways, especially when you have to emphasise and say the word slowly, along with the child’s name. Looking at Amazon reviews for this book, it’s clear that a lot of parents swear by this book as a way of getting their child to sleep at night but I honestly can’t see the appeal of this particular story. This may make me sound cynical, but, if anything, this long-winded tale is more likely to send the child to sleep through boredom, rather than through any special language that helps children to relax.